When thinking about the recipes to share with you during Chocolate Month at My Gluten-free Kitchen, I knew I had to include these delicious brownies. It is no secret that I love the combination of peanut butter and chocolate. I probably have 20-30 recipes that use this combination of yummy ingredients. Eventually they’ll all make their way onto the blog as I’m sure a lot of my readers love this combo as well. I made these yummy Reese’s Brownies back in my gluten days, and was so glad to find out I could easily adapt them to be gluten-free. I checked on the gluten status on the Reese’s peanut butter cups and the peanut butter chips that I use in these. According to the gluten-free info provided by Hershey’s, All Reese’s peanut butter cups are gluten-free EXCEPT the seasonal shapes. So don’t pick up those cute heart-shaped, egg-shaped, tree-shaped, etc. peanut butter cups. Stick with the regular ones! The Reese’s peanut butter baking chips are also on the gluten-free list. 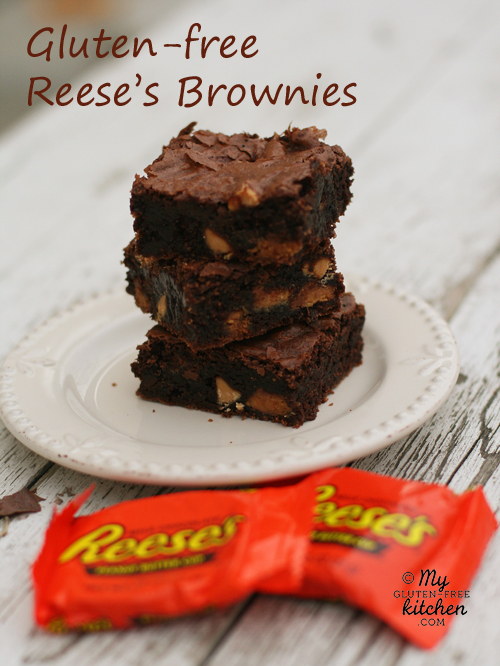 Each bite of these chewy brownies is full of fudgy chocolate and peanut butter flavor. The peanut butter baking chips amp up the peanut butter flavor in these, but if you don’t have them, you could use more peanut butter cups or use some milk or semi-sweet chocolate chips instead. Check out my post on baking chocolate and cocoa to see which brands I recommend you use. Also, don’t use just any kind of gluten-free all-purpose flour, they are not all equal. I highly recommend gfJules and Gluten Free Mama’s all-purpose flour blends. 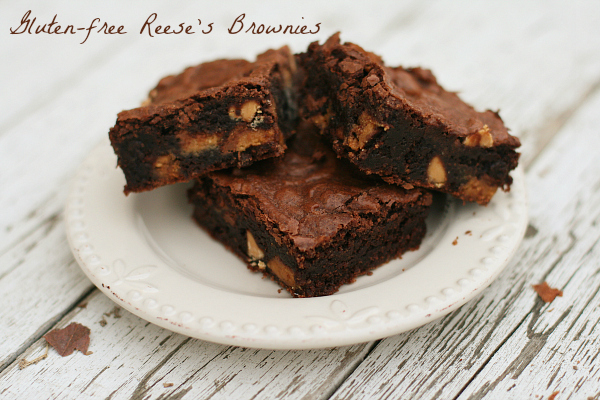 Chewy Brownies with intense chocolate and peanut butter flavor. Preheat oven to 350°. Lightly grease a 9x13 baking dish. I prefer using a glass one. In a mixing bowl, combine the melted butter, sugar, and vanilla. Beat in the eggs, one at a time, mixing well after eat, until thoroughly blended. In a separate bowl, whisk together the flour, xanthan gum, cocoa powder, and salt. Gradually stir the flour mixture into the butter mixture in the mixing bowl until blended. Stir in the chopped peanut butter cups and the Reese's peanut butter chips. Spread the batter evenly into the prepared baking dish. Bake in a preheated oven at 350° for about 35-40 minutes, or until a toothpick inserted near the center comes out clean or with crumbs only, no batter. Remove from oven, and cool pan on a wire rack before cutting. *I've tested this withGluten Free Mama's Almond Flour Blend and gfJules flour and recommend either! If using a flour blend that already includes xanthan or guar gum, then omit the xanthan called for in the recipe. If using a gluten-free flour that has xanthan gum already in it, then omit the xanthan gum listed in this recipe. I recommend gfJules and Gluten Free Mama's all-purpose flour blends for best results. my GF coworker would love these so much! I’m sending her the recipe. I love the reese’s inside and the peanut butter chips. 🙂 Can you really go wrong with peanut butter and chocolate? Sally, I missed this reply somehow, so I just saw it tonight. Sorry for the lack of response. I appreciate your comment and you sending the recipe to your coworker! You rock! If I was to cut back on the coco powder some would I have to put extra anything on it? Say I cut to 1/2 cup coco powder would I need to add more….flour. Mykel, I’m not sure why you would want to cut the amount of cocoa. If you just don’t have enough baking cocoa on hand, I’d suggest cutting the entire recipe in half and baking it in an 8×8″ pan instead. If you are wanting to make this less chocolatey (heaven forbid! ), then I would think you could safely cut it back to 3/4 cup without much effect on overall texture. I can’t guarantee though since I haven’t tried that! I am new to the gluten-free world and this blog has so much good information. I cannot wait to try these..